Apart from the difference in the taste of the ingredients, there is also the problem of trying to find what you need. Some things are not available, and other things go by a different name – well, everything goes by a different name until you have learnt the local language, if it’s not English. I tried to make a milk tart (a traditional South African tart) soon after arriving and bought something called Weizella, thinking it sounded like corn starch, but it turned out to be another form of starch made from wheat which was a lot stronger. I ended up with about a litre of lumpy milk custard so thick that a spoon could stand up in it. Another baking attempt (Chelsea buns) resulted in a batch of rock hard buns, because the types of flour here also take some figuring out. What we call “cake flour” in South Africa seems to be similar to the “Dinkelmehl” here, and once I’d sorted that out my baked goods improved substantially. In the beginning when moving to Berlin I could only find small supermarkets, but once I’d found the bigger ones like Kaufland and some of the larger Edekas or Rewes, finding most ingredients was not a problem. Even with some relatively big Kaisers, I’ve on occasion had trouble finding beef mince (rindhackfleish) and chicken breasts – instead they’ve had only pork mice and turkey. However there are a few things from South Africa that you can’t get in Berlin (or that you can get but in a specialist shop at a price, like chutney), and most South Africans come back from visits home with suitcases stuffed with ingredients. If you are coming from South Africa for the first time, some things you might want to pack are: baking powder (my friend Skaapie swears the German one is not the same, although I’ve used it and it seems ok), chutney, vanilla essence (the one here is very different), spice mixes and stock/gravy mixes, Maizena cornflour, custard powder, Spray and Cook, instant oats (if you like that for breakfast). They seem to sell Aromat here now, and you can buy caramelized condensed milk (like Carnation Caramel Treat) and breakfast instant oat packs from Russia. 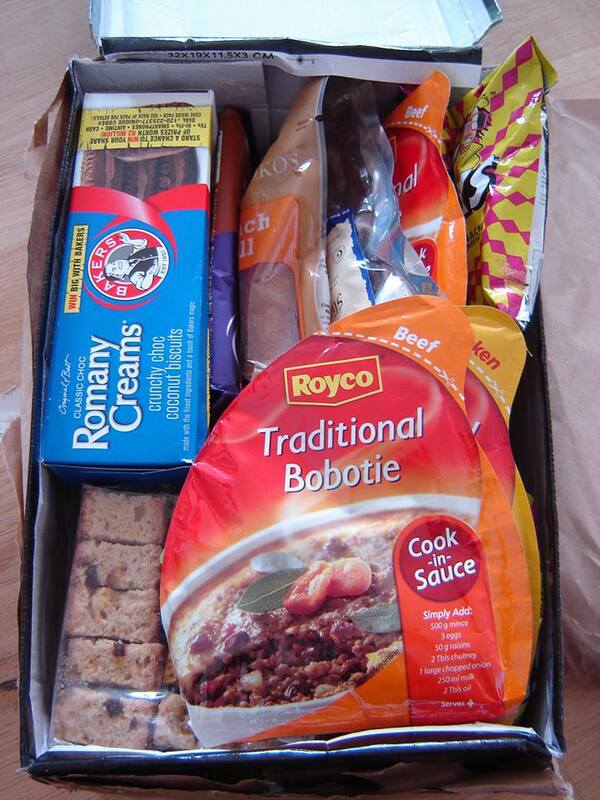 In my first year here a kind friend sent me an amazing care package of South African goodies. It’s amazing how comforting it was just to taste things from home. 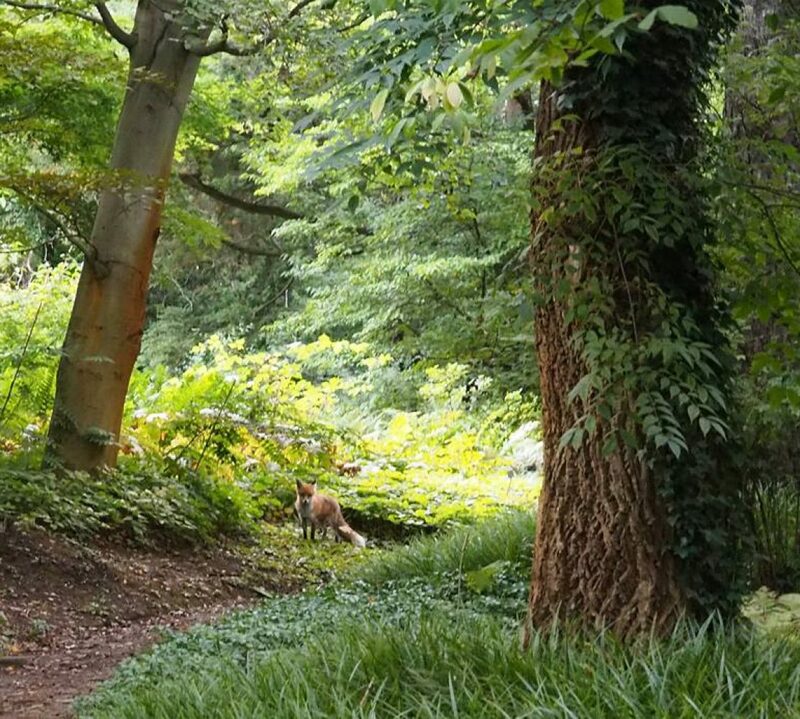 All that said – for the most part it makes more sense to try to work with the local ingredients, because usually trying to cook dishes from home with the local ingredients leads to disappointing results. You will find ingredients here that you probably won’t see in South Africa, for example Spargel (white asparagus), Kohlrabi (a cabbage like vegetable with a different, sharper taste, good in soup), a wider variety of pumpkins (but don’t expect to find gem squash), Quark (tastes somewhere in between yoghurt and creamed cottage cheese) and Mohn (black poppyseeds – here it comes in big bags and is used abundantly in cakes and buns). At Christmas the shops have an abundance of delicious sweet cookies and chocolates: Lebkuchen, pfefferkuchen, Lindt Chistmas nuts (covered in chocolate with some spices – delicious), marzipan potatoes and so on. The first two Christmases here I was satisfied with that, but this year I found myself thinking it would be nice to have some fruit cake or mince pies. 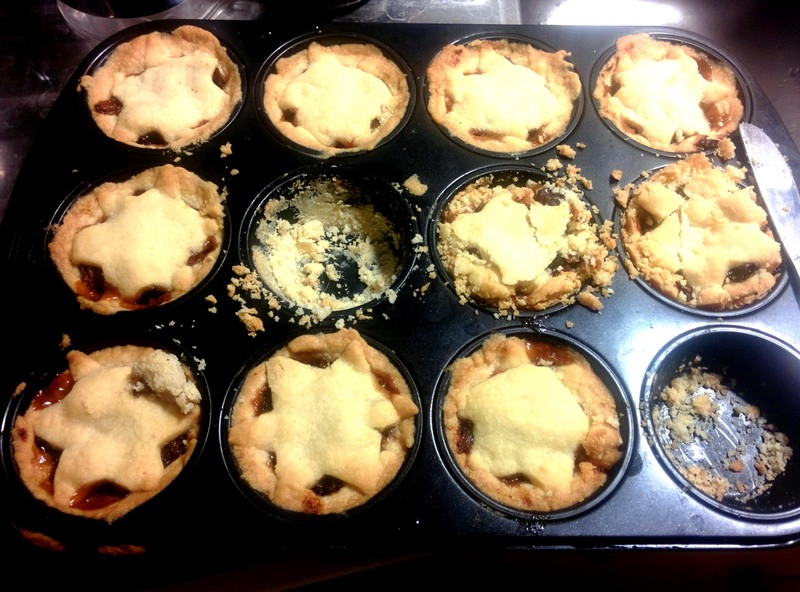 I decided to make some mince pies after being invited to a Christmas party where we were supposed to bring a Christmas dish from home. The first thing I realized was that you cannot buy mince in Germany. (At this point I should put in a note on “mince”. The first time I asked J if he could pick up some mince from the supermarket, he came home with a bunch of leaves and asked if this bag was ok. Upon confused inspection I found that he’d come home with some Minze (the German word for mint – pronounced the same as mince)! I should have asked for Hackfleish. Since I then explained to I would normally use mince to refer to minced meat, he then had a very dubious expression when I mentioned making mince pies. But in this case the mince is fruit mince. Another example of English being a crazy language, he says). 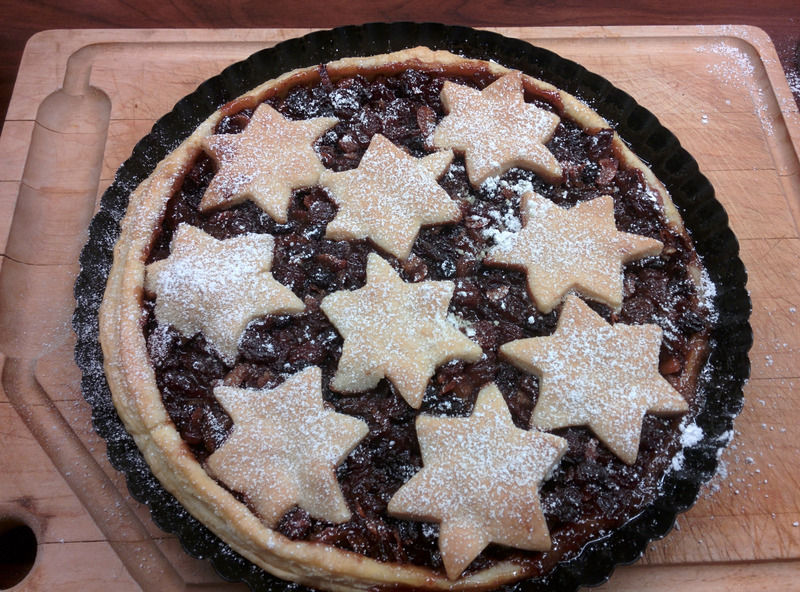 Anyway – I found a recipe for (fruit) mince online. 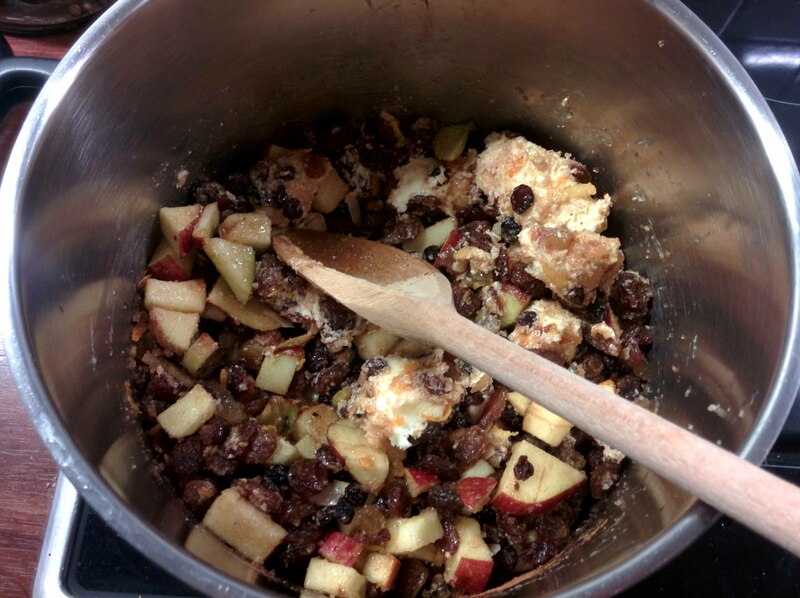 You can basically make it by boiling together for a while some raisins, sultanas, currants, finely diced apple, some orange and lemon peel (the glace kind) with some sugar, butter, the juice and rind of a lemon and orange, a pinch of salt, and then throwing in some brandy at the end. The end result smelt satisfyingly like the mince that comes in jars at the supermarkets at home. The next thing I realized was that I could find all manner of pastries in the German supermarket (blätterteig – puff pastry, pastry for crumbles, pastry for pizza, etc etc), but not the pastry I needed (shortcrust pastry). So again I tried an online recipe. Since I was pressed for time, I tried a recipe that promised to yield a pasty that was easy to press into the patty pans (i.e. no rolling). The pies looked good when they went into the oven. But the recipe was from the UK and they probably have yet another flour system, as when I tried to get the pies out of the pan they all fell into pieces. Panic! I wrote home and asked for reliable shortcrust recipes, but after the saga of the first batch I didn’t feel like making more so instead decided to follow the “use local ingredients” policy and used good old German blätterteig to make one big pie instead of lots of little ones. It worked fine. 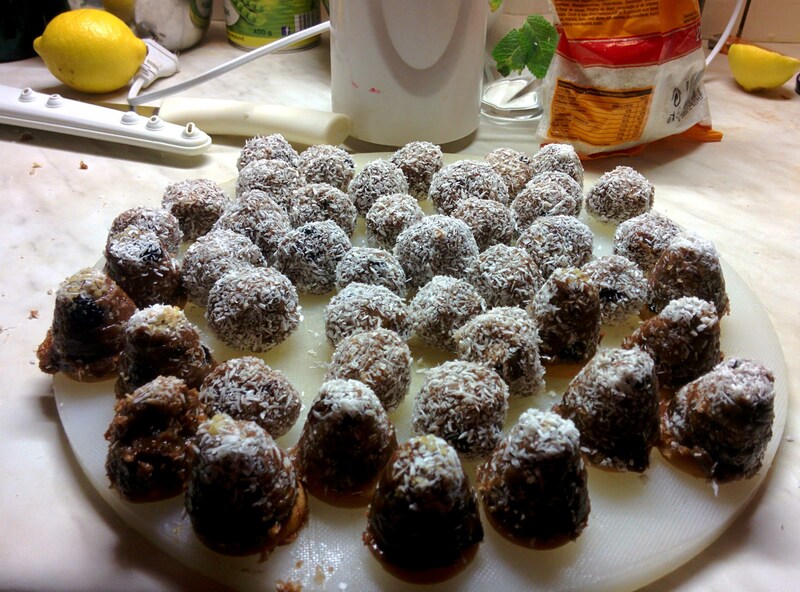 In the meanwhile I had a big pile of destroyed mince pie crumbs to deal with, so the night before we left for Czech I followed the old trick of bakeries with leftover cakes and made them into rum balls. Basically you bash down the cakes into crumbs and blend them with some rum, apricot jam and a little cocoa powder. If the cake you are using doesn’t have any raisins in (not a problem with my mince pie remains), you can add some as it goes nicely with the rum. Blend it well and it makes a smooth, thick ball of rummy dough. Roll these into balls and roll the balls in desiccated coconut. They are delicious. Unfortunately we did not have any coconut the night before leaving to Czech, so we rolled them in the leftover sugar mix from the Vanilla Crescents that J had made. Needless to say, they did not survive the train ride here, and by the time we arrived some of them had reformed into one big ball, and others were separate but in squidgy blobs rather than balls. Despite their appearance they were still politely served up with the other delicious Czech Christmas cookies. 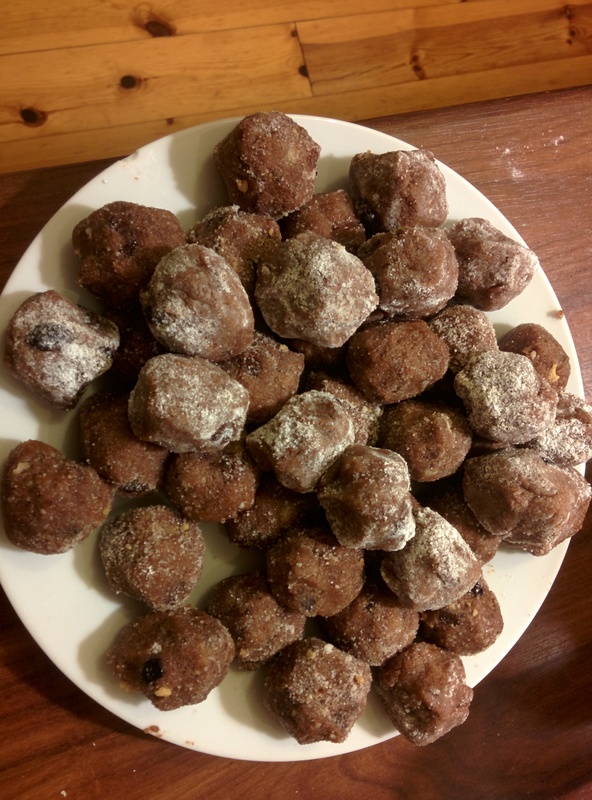 It turns out that they make similar rum balls in Czech – here they are called Rumové količky. Luckily J’s mom had some coconut, so on boxing day J and I re-rolled all of them. 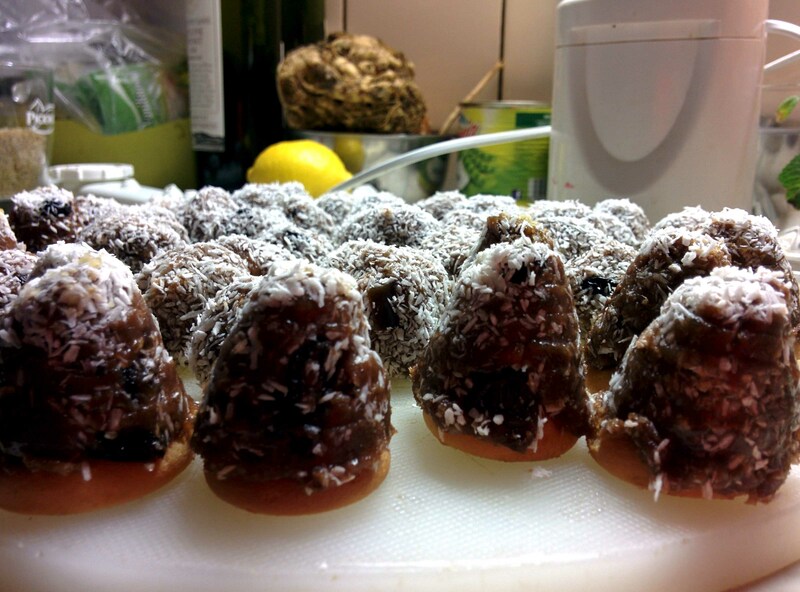 He also showed me how they form them into little domes with beehive moulds, and mount the domes onto a small biscuit called a piškoty (I will post a recipe for these at some point). You can even make a gap in the middle of the dome and fill this with Eierlikör(or another Christmas liqueur), which sounds delicious. 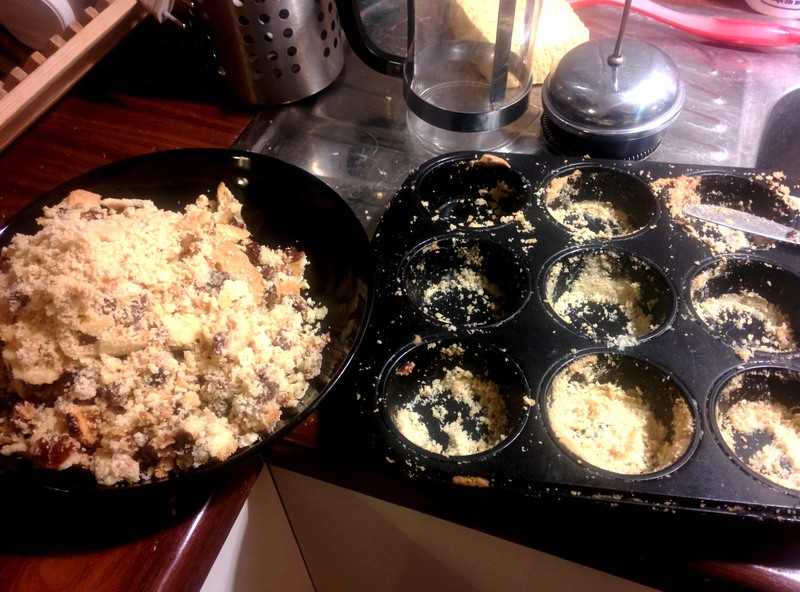 At any rate, the rum balls which were mince pies disappeared quite quickly – we’ll have to make some more!